Ok...I admit it. I was a bit apprehensive when I was chosen to review Latina Christiana I Comeplete Set. by Memoria Press. Mr. B had a class dedicated to Latin in a Co-op we attended, but he hated it so much that he'd cry and ask to go home. Latin just wasn't his thing. That was all before we were introduced to Latina Christiana I. Oh My Goodness! Mr. B would ASK, nearly BEG, to do his Latin work! I have been so blown away! Latina Christiana I is so much more than just a "foreign language." It encomasses a bit of history, and it is a fantastic way to teach and learn grammar! Before even finishing the first disk, Mr. B had already learned that France used to be called Gaul (Gallia in Latin) and the Gauls were barbaric and attacked Rome. He also learned the difference between 1st person, 2nd person, and 3rd person, and why and how these change the use of verbs and their conjugations. That doesn't even count the vocabulary lessons! Latina Christiana I is a great foundational course to begin your Latin studies, but it is so much more than "just" Latin. 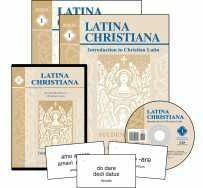 For this review, we were graciously give the Latina Christiana I Complete Set which includes the instructional DVDs, pronunciation CD, Student Book, Teacher's Guide, and flash cards. The complete set has everything you need for your child to successful develop a great foundation in Latin! As you all know, my son has autism. Finding good fits for us has led to an eclectic mix. In that mix I never dreamed I would find classical education materials as I did not think it would be a good "fit" for him. boy was I wrong! And really, with the memorization that comes along with a classical education, why did I think this anyway?! I popped in the first disk, and my son was mesmerized! He instantly began to interact with what he was watching from the disk-Answering along with the instructor. he was eager to do the workbook work. He began to really grasp grammar rules, and his vocabulary and understanding of context clues in terms of word meanings has taken off! He ASKS to do his Latin! This is mind blowing for me, and something I would have never thought! HE LOVES IT! He can now hear a familiar word, such as Laboratory, and will tell anyone willing to listen the what the Latin root is. He is easily able to conjugate Latin verbs, and this has led to a better understanding of English grammar. I am so thrilled and excited! WE LOVE LATINA CHRISTIANA! Does Latina Christiana Pass My 4 Ingredient Test? 1.) Customization: Is it easily adaptable? Can we customize it to fit “us?” Can we modify or set our own schedule? Can we take breaks, jump ahead, or flat out skip? This is one of those programs you really can't skip ahead. Everything builds upon everything before it. I highly suggest keeping up with the suggested plan of instruction. There are no hidden fees. You have physical products, with no need for anything additional. It will cover multiple grades, so you can use it for children who are close in age/ability. It is designed to be a year long study, and there are other products available for extended studies beyond Latina Christiana I. It is worth the money in my opinion, just based off our personal results. My son did not find this boring at all. There's nothing flashy or anything like that. The background is plain, the instructor is pleasant with a smooth and sure voice/speech. It doesn't feel as if you are being "talked at" but more like you are being "spoken to." Each lesson is short. The video does not last very long, and each lesson that includes the pronunciation disk is not long. We tend to finish a lesson in about 20 minutes or less. Often times, we will spend 30-35 mins and complete 2 lessons at one sitting just because he wishes to continue. WE LOVE IT! I've become a big Memoria Press fan. This was the second product I've had the blessing to review for Memoria Press, with the first being their New American Cursive. Memoria Press continues to bring quality homeschool products with Latina Christiana I! I will update this post with photos soon. I am at my mother's and I've managed to leave my photos at home! So stay tuned for those! PLEASE check out the other reviews of this product, as well as others from Memoria Press (including that history I mentioned!) Just click below and you'll be whisked away to a world of fantastic reviews! GOD BLESS! Great review. I've heard so much positive about this curriculum. I'd love to see the photos when you can add them!